A few weeks ago we celebrated our 11th anniversary. I was all set to tell the story of our wedding and took a bunch of pictures of our old wedding photos (we were wed in the pre-digital era, unfortunately, so getting the pictures online is not an easy process) and then I was hit with a bout of lethargy which kept me away from the computer. I don't know if it's directly pregnancy related, or if this summer's endless heat wave finally got to me, or what, but I've stopped loving being pregnant and now just want this baby to come out. So the wedding story (stories actually, as we ended up having four different celebrations) will have to wait, and all you get for now are the pictures. We celebrated our anniversary in a very small way. Hideaki brought me a little bouquet of flowers, and I cured this year's first batch of ikura (salmon roe), which was put to use in the dinner above. 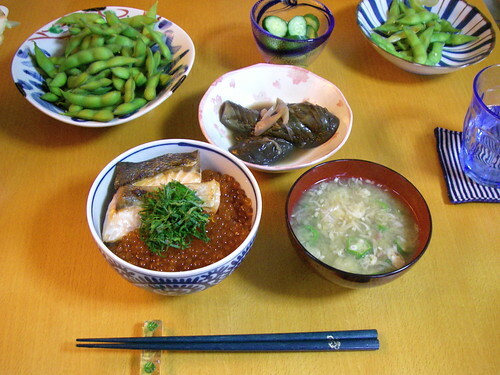 Clockwise from top left: edamame (green soybeans); kyuri no asazuke (quick-pickled cucumbers); nasu to myouga no nimono (simmered eggplants with ginger buds); okura to myouga no misoshiru (miso soup with okra and ginger buds); and umi no oyakodon (mother-and-child seafood over rice). Oyakodon (mother-and-child over rice) usually refers to a chicken and egg dish, but this seafood version uses salt-grilled salmon and salmon roe, with a garnish of shiso (perilla). For an anniversary lunch out we went to our favourite local seafood restaurant, Marufuku. 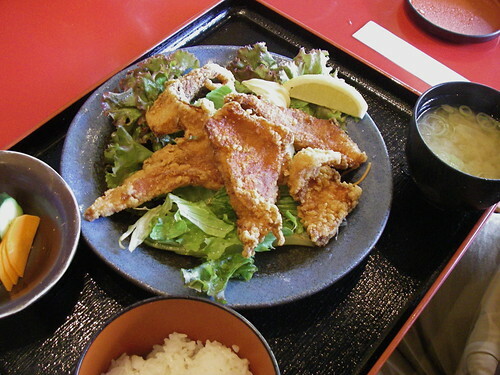 Hideaki had the kinmedai furai teishoku (deep-fried alfonsino lunch set). Alfonsino being a high-mercury fish I only snuck a few bites, and man was it ever good. It was also very rich though, and I couldn't imagine eating a whole plate of it. I chose the sashimi moriawase teishoku (assorted sashimi lunch set), which came with a salad and chawan mushi (savoury egg custard), not shown, and the tray above: pickles, rice, miso soup and a beautifully arranged plate of sashimi. 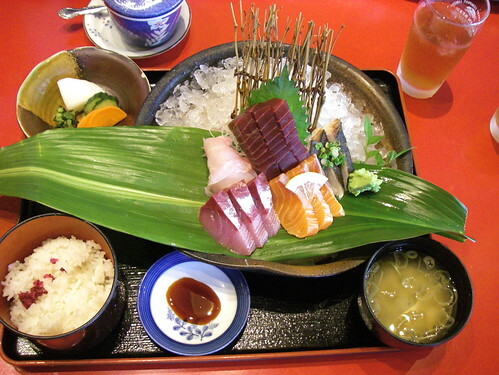 Clockwise from left: suzuki (sea bass); maguro (tuna); sawara no aburi (seared king mackerel); shake (salmon); and buri (yellowtail). It was all excellent, particularly the sawara, which is not a fish I eat often for some reason. Researching it later I discovered that it's very high in mercury, which was a bit of a surprise- I'm pretty careful about mercury but I guess because I don't come across sawara very often it just wasn't on my radar. And here I was worried about the tuna (I gave most of it to Hideaki) and alfonsino. Actually, I've just checked the the Japanese government's mercury guidelines, and sawara tests as low in mercury (the high mercury listing mentioned above is American). Who to believe? I don't think the very small amounts of tuna, king mackerel and alfonsino I ate have any chance of harming the baby (and all the good stuff from the fish would outweigh any harm anyway), especially given how careful I normally am. But how frustrating to have two official sources give such vastly different information! I swear, once this baby is born I'm going to have the biggest mercury feast ever. happy 11th! hope your delivery goes smoothly. take care! Happy anniversary! My kids are big now but I totally remember that feeling of just wanting to get the pregnancy over with. Best of luck with the delivery. Happy Anniversary! That is a marvelous wedding gown! With fish names it's sometimes really difficult to determine what fish is being referred to, where. Sawara, or "Spanish Mackerel" (Scomberomorus maculatus) doesn't rank high in mercury, but it's sometimes confused with King Mackerel (Scomberomorus cavalla), which Wikipedia notes is high in mercury. The problem is, you never really know what fish you're buying in the grocery store, fishsellers can be pretty cavalier with names when it comes to marketing fish. Happy anniversary and best of luck with the baby! First time at your blog. It is great showing the different perspectives of lives. I wish you a smooth pregnancy and delivery. Your blog is great! Just found it a couple of days ago and I'm really enjoying all of your posts. Especially your food posts & posts about pregnancy in Japan. I have a question--I wonder if you could post (in the comments or whatever) the link to the Japanese government's mercury guidelines, or send me an e-mail. I read Japanese, but I've had trouble finding these guidelines with a google search. JOYEUX ANNIVERSAIRE de mariage!Vous etes trés beaux tous les 2 et on voit combien vous vous aimez....J'ai déjà gouté les haricots verts qu'il y a sur la 2eme photo...DELICIEUX!!! I love to cook Oyakodon as it is a real home-style Japanese dish. 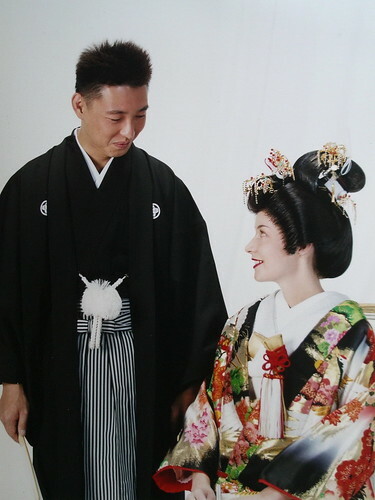 I run Japanese Cooking Lessons here in London, please have a look and keep in touch!